As our daylight hours dwindle, I am always reminded of Dylan Thomas. Not because he wrote “A Child’s Christmas in Wales,” but because of his poem “Do not go gentle into that good night.” Thomas of course was writing of a much more permanent darkness, not the perennial shrinking of the day’s sunlit hours, but still, I always “rage, rage, against the dying of the light” at this time of year. The Winter Solstice, which occurs on December 21 this year, is the shortest day of the year. The good news is, days will very slowly get longer and longer, until the Summer Solstice in June. 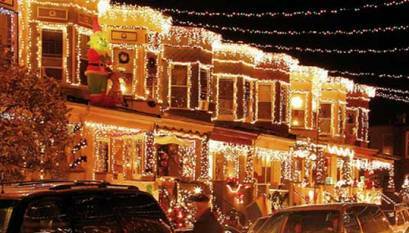 But if you can’t wait that long to bask in bright light, walk, bike, or drive over to the Hampden neighborhood for one of Baltimore’s weirdest traditions: Miracle on 34th Street. Now in its 71st year, this block-long display of lights, moving figures and sculpture is definitely a one-of-a-kind holiday experience. Some call it “gaudy, ugly”, and some call it “awesome, beautiful”. Either way, go see it and decide for yourself. It’s part of the Hopkins experience!